What is the Haunted Vegas Tour. Haunted Getaways across the nation! Top Ten Most Haunted Ghost Tours! What is the Haunted Vegas Tours? It’s a guided ghost tour of Las Vegas' most haunted locations. Where is it located and what are the show times? Where is the Royal Resort? Is the Haunted Vegas Tour hokey? No. 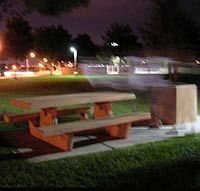 The Haunted Vegas Tour is designed to point out and inform the public about legitimate documented ghost sightings in the Las Vegas area. While the tour was created to be interesting and a lot of fun . . . It is not a "ghosts & goblins" amusement park ride. Video cameras are NOT allowed in the show room or on the tour bus. However, the taking of photos with a still camera is "encouraged." Do you get off the bus at any time during the tour? Yes. There is a short (optional) walking visit at a spooky haunted park. Comfortable shoes and jackets are suggested (depending on weather conditions). This spirited and spooky Haunted Vegas Tour will take you to the haunting grounds of Bugsy Siegel, Liberace, Redd Foxx and Elvis. Robert Allen, creator of the tour now makes it possible to visit such eerie sites by offering a guided Haunted Vegas Tour and Show, featuring Sin City's Darkest Ghostly Secrets. 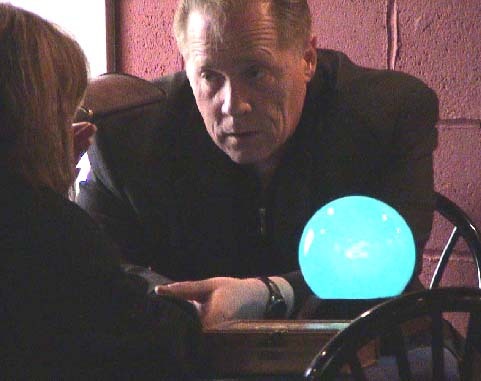 Additionally, experience the supernatural at the Las Vegas Seance that provides a spine tingling look into the dark and mysterious side of the afterlife. According to Allen, who consulted with Tim Cridland, a paranormal historian and Janice Oberding, author of the book "Haunted Nevada", there are more than 21 places where paranormal activity has been documented in Las Vegas. The Haunted Vegas Tour covers such sites as the "Motel of Death," where numerous celebrity deaths have occurred, and the former home of a Las Vegas legend whose ghost continues to haunt despite numerous attempts to exorcise it. Established in 1905, Las Vegas officially became a city in 1911. With the growth that followed, at the close of the century Las Vegas was the most populous American city founded in the 20th century (a distinction held by Chicago in the 19th century). The city's tolerance for various forms of adult entertainment earned it the title of Sin City, and this image has made Las Vegas a popular setting for films and television programs. Outdoor lighting displays are everywhere on the Las Vegas Strip and are seen elsewhere in the city as well. As seen from space, the Las Vegas metropolitan area is the brightest city on Earth. as Vegas is a popular destination for Hawaiians. In 2002, almost 80,000 former residents of Hawaii lived in Las Vegas, and nearly 3,000 Hawaiians visited Las Vegas every week.Las Vegas is sometimes referred to as Hawaii's Ninth Island. The city is the home to the first ABC Stores branch outside the state of Hawaii. The first reported visit to the valley by someone of European descent was Raphael Rivera in 1829. Las Vegas was named by Spaniards in the Antonio Armijo party, who used the water in the area while heading north and west along the Old Spanish Trail from Texas. In the 1800s, areas of the Las Vegas Valley contained artesian wells that supported extensive green areas or meadows (vegas in Spanish), hence the name Las Vegas. John C. Frémont traveled into the Las Vegas Valley on May 3, 1844, while it was still part of Mexico. He was a leader of a group of scientists, scouts and observers for the United States Army Corps of Engineers. On May 10, 1855, following annexation by the United States, Brigham Young assigned 30 missionaries of The Church of Jesus Christ of Latter-day Saints led by William Bringhurst to the area to convert the Paiute Indian population to Mormonism. A fort was built near the current downtown area, serving as a stopover for travelers along the "Mormon Corridor" between Salt Lake and the briefly thriving colony of saints at San Bernardino, California. However, Mormons abandoned Las Vegas in 1857. Las Vegas was established as a railroad town on May 15, 1905, when 110 acres (44.5 ha) owned by Montana Senator William A. Clark's San Pedro, Los Angeles and Salt Lake Railroad, was auctioned off in what is now downtown Las Vegas. Las Vegas was part of Lincoln County until 1909 when it became part of the newly established Clark County. The St. Joan of Arc Catholic Church near 4th and Bridger in downtown was founded in 1910. Las Vegas became an incorporated city on March 16, 1911. Las Vegas started as a stopover on the pioneer trails to the west, and became a popular railroad town in the early 1900s. It was a staging point for all the mines in the surrounding area, especially those around the town of Bullfrog, that shipped their goods out to the rest of the country. With the proliferation of the railroads, Las Vegas became less important but the completion of the nearby Hoover Dam in 1935 resulted in the growth of residents and tourism. The dam, located 30 mi (48 km) southeast of the city, also formed Lake Mead, the world's largest man-made lake and reservoir. Today, tours are offered into lesser known parts of the dam. The legalization of gambling in 1931 led to the advent of the casino-hotels, for which Las Vegas is famous. Major development occurred in the 1940s. The success of the city's early casino businesses was owed to American organized crime. Most of the original large casinos were managed or at least funded under mob figures Benjamin "Bugsy" Siegel, Meyer Lansky or other mob figures at this time. The rapid growth of this gambling empire is credited with dooming Galveston, Texas; Hot Springs, Arkansas; and other major gaming centers in the 1950s. With the arrival of billionaire Howard Hughes in the late 1960s, who purchased many casino-hotels and television stations in the city, legitimate corporations began to purchase casino-hotels as well, and the mob was run out by the federal government over the next several years. The constant stream of tourist dollars from the hotels and casinos was also augmented by a new source of federal money. This money came from the establishment of what is now Nellis Air Force Base. The influx of military personnel and casino job-hunters helped start a land building boom which still goes on today. Though Las Vegas's gambling revenues have been surpassed by Macau, the city remains one of the world's top entertainment destinations. This spirited and spooky ghost tour will take you to the haunting grounds of Bugsy Siegel, Liberace, Redd Foxx and Elvis. Robert Allen, creator of Haunted Vegas Tours now makes it possible to visit such eerie sites by offering a guided Tour and Show, featuring Sin City's Darkest Ghostly Secrets. According to Allen, who consulted with Tim Cridland, a paranormal historian and Janice Oberding, author of the book "Haunted Nevada," there are more than 21 places where paranormal activity has been documented in Las Vegas. The tour covers such sites as the "Motel of Death," where numerous celebrity deaths have occurred and the former home of a Las Vegas legend where his ghost continues to haunt despite numerous attempts to exorcise it. Includes admission to the hit show "Haunted Vegas" at the Greek Isles Hotel & Casino. 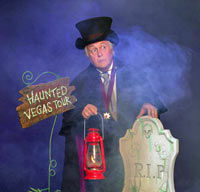 Producer Robert Allen is proud to bring the show "Haunted Vegas" to the Las Vegas Strip. Hailed as Las Vegas' only Late Night Paranormal Show. "Haunted Vegas" is the brainchild of Allen who has had the concept for over 7 years. Inspired by séances, haunted houses and ghost movies. "Haunted Vegas" features the unusual talents of "Zamora" of Ripley’s TV fame and the very funny Jac Hayden who coincidentally is also a licensed mortician. If you are looking for something different the "Haunted Vegas Show" offers a supernatural alternative to the neon side of sin city. Click the link below for a price quote on your preferred travel date. Our pricing is constantly updated to ensure you always receive the lowest price possible.